Photo Rejuvenation has revolutionised the treatment of ageing and sun-damaged skin. Pulsed light therapies channel different wavelengths of light to target superficial skin irregularities, such as hyperpigmentation, uneven texture and loose tone with no downtime. 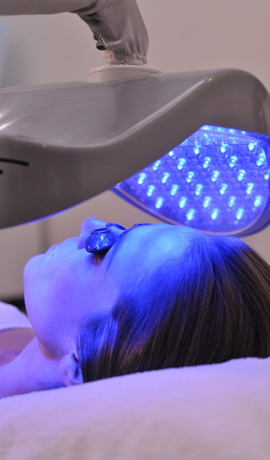 At Beyond MediSpa we use the most advanced light therapies to ensure the very best results for a fresher-looking complexion. Treats hyperpigmentation and age spots, red veins, rosacea and redness, uneven texture and loose skin anywhere on the body, including the chest and hands. Also known as Intense Pulsed Light (IPL) or Photofacial, Photo Rejuvenation uses flashes of intense, pulsed light passed through various filters, which modify their wavelengths and energy levels, according to the problem being treated. Your Aesthetician may recommend a course of treatments. Firms loose skin in any area of the body. The FDA approved The Profile™ device uses broadband light energy to send heat deep into the skin. This stimulates collagen production, which tightens and firms loose skin. This treatment is highly recommended in conjunction with Photo Rejuvenation, a MicroLaserPeel™ and / or VelaShape. For maximum results, your Aesthetician will suggest a course of four to five sessions with three to four weeks between them.